Afghanistan's National Security Adviser resigned from his post on Saturday, sources have confirmed. Minutes after Atmar's resignation, President Ashraf Ghani appointed his ambassador to Washington DC, Hamdullah Mohib, as his new National Security Adviser. 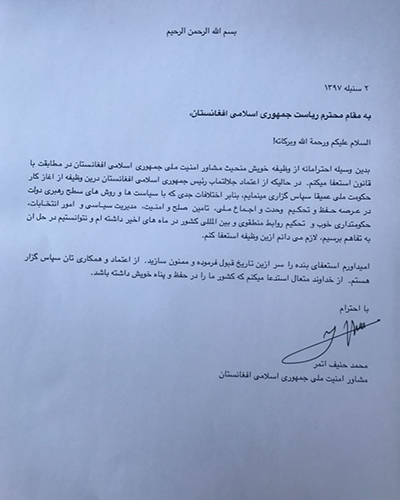 Atmar's letter of resignation meanwhile stated that he is stepping down due to "serious differences over policies and approaches at the top level of government." He said he differed in opinion "when it comes to national unity, national consensus, peace and security political management, electoral affairs, good governance and regional affairs." Atmar also stated that "because of my differences of these things in recent months I am stepping down because we haven’t reached a consensus." Atmar, 49, has been a close aide to President Ashraf Ghani since 2014. He has been considered by some as the second-most powerful official in Afghanistan, Reuters stated adding that a senior government official close to Atmar, who spoke on condition that his name was not used, said the former security adviser was considering running against Ghani in the 2019 presidential elections. Atmar was also interior minister during former president Hamid Karzai's tenure until 2010. The Presidential Palace meanwhile issued a statement late Saturday saying Ghani had accepted Atmar’s resignation and stated Hamdullah Mohib, ambassador to Washington, has been appointed in his place. The national security adviser said he is stepping down due to "serious differences over policies and approaches at the top level of government."